The bride spends a lot of time choosing her wedding outfit so it’s only fair that the groom should be able to have some input into his too. If you’re looking for something out of the ordinary for your groom here are some major groomswear trends to inspire you. A tailored dark wool pinstripe suit is the hallmark of the slick city look and the groom can put on a trilby, glossy leather brogues, and braces to finish off the look. Combine pink with a grey suit, and light blue with a navy suit. Bold stripes are also popular and a coloured striped necktie and matching striped shirt make a strong statement. Always a classic and as fashionable a choice as ever, the morning suit is a wedding staple with the tailcoat and pinstripe trousers adding a touch elegance. Wear with a waistcoat, a crisp white cotton shirt, and a coloured cravat with pin. A top hat and a chic pair of gloves will complete the look. Grey works well in the spring/summer months, but go for a black tailcoat with silk lapels for a winter wedding. Don’t panic, we’re not suggesting a wetsuit. For a casual yet elegant seaside wedding outfit, the groom could sport a light linen suit with a pale coloured cotton shirt, a silk or cotton cravat style tie , and a straw trilby. Smart brown leather flip flops will help to keep him cool. For formal event, you can’t go wrong with the classic black tuxedo; guaranteed to make any groom look like 007 himself. 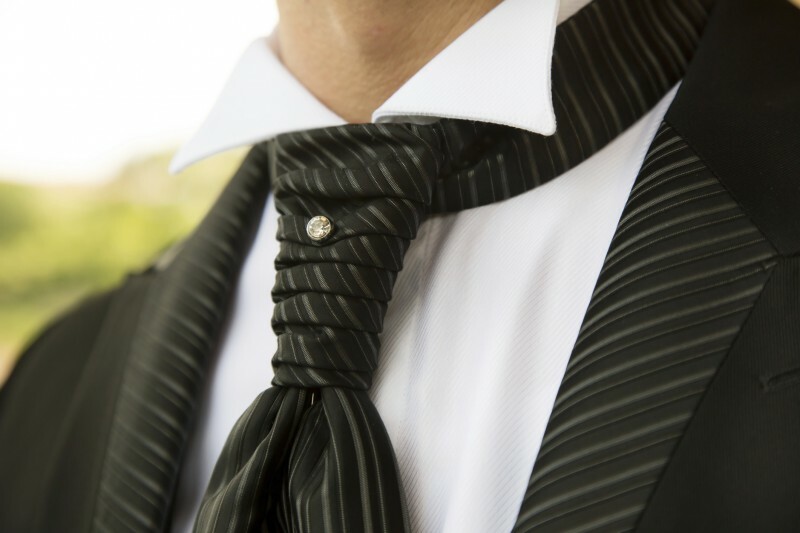 A black suit, ideally with subtle satin stripes, a white shirt, and a black bow tie can be accessorised with a black scarf and gloves, and patent lace up round toed shoes. Ideal for an outdoor summer wedding, an all-white silk or linen suit will certainly draw attention to the groom. Team it with white shoes, a crisp white shirt and a tie in the wedding theme colour, and add a white waistcoat if the suit is smart enough. Keep the suit plain and simple; a single breasted jacket with just one button is the best choice. Most importantly make sure the shade of white blends in with the shade of the bridal gown. Mixing and matching colourful suits, patterned shirts, and unusual accessories takes a creative eye, but the result can be a totally unique look, and for grooms that really want to reflect their personality through their wedding outfit, there are absolutely no rules. Plum, orange and silver are all interesting colours for suits, and polka dots, stripes, or floral patterns can be great designs for shirts. Perhaps start with one piece of clothing such as a bright coloured scarf, or a pair of favourite wedding shoes, and put together a colour palette from there.